Enter this two level townhouse to the open concept living/dining/kitchen area. This area offers a full kitchen with microwave; dining table seating six; and living area with flat screen television, DVD and wood burning fireplace. A half-bath can be also be found on the entry level as well as access to the back deck with wooded view. The upper level of the townhouse offers two bedrooms each with their own private bath. 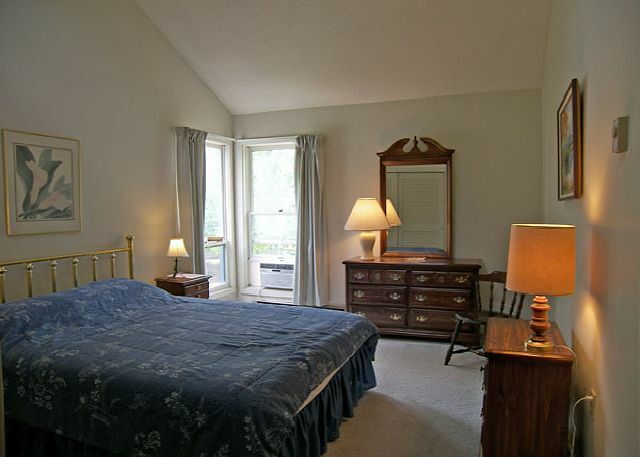 The master bedroom has a queen size bed while the second bedroom offers two twin beds . The laundry closet (with HE washer/dryer) can additionally be found on the second level. Very good experience. New stove/oven this year!!! We love this location and access to the pools and jacuzzi. No A/C with this unit which fine but this year was hot and humid and one of the bedroom windows had no screens. But all in all a clean unit that we keep coming back to each year. Loon Reservation Service has been so good to our family over many years. Great Location, Wonderful Management Company! 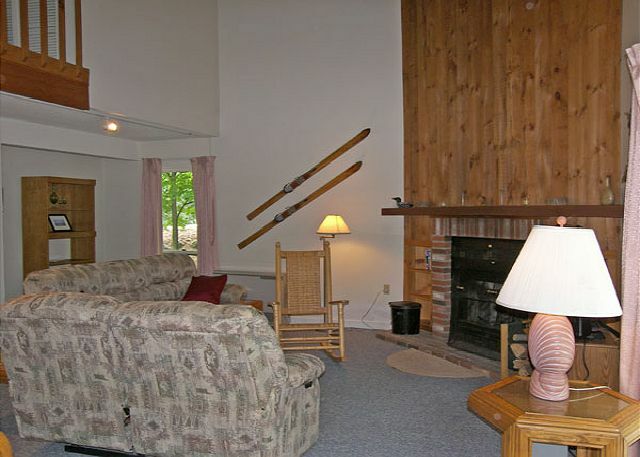 We have rented this condo for the last five ski seasons. 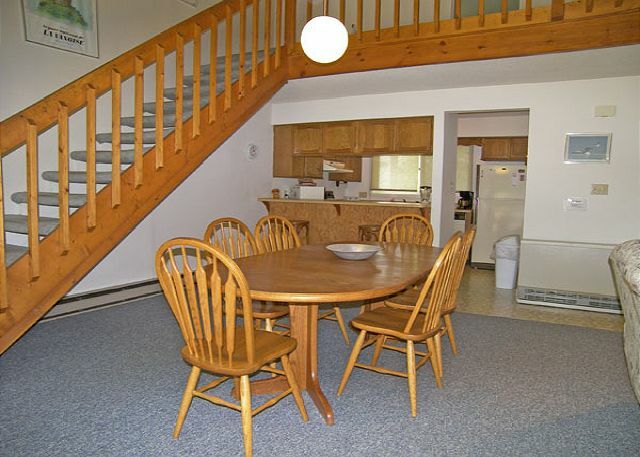 It is in a quiet complex, convenient to everything, and well stocked. We had a couple of issues due to the age of the furnishings, but they were quickly resolved by Loon Reservation Service. They are truly wonderful to deal with! The condo is clean, comfortable, and roomy. We look forward to returning next season! 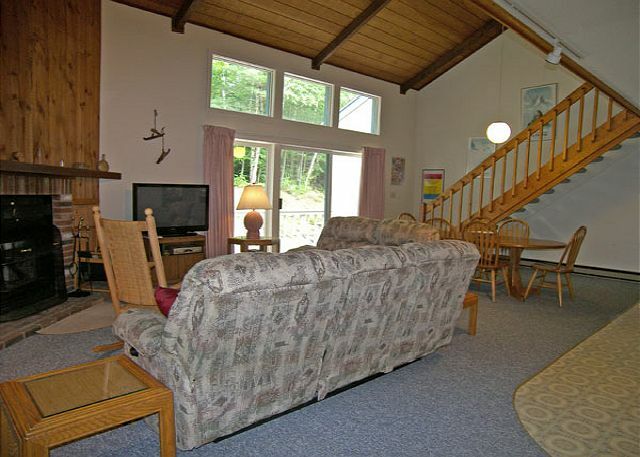 Cindy M from Hinsdale, NH does not recommend this vacation rental. We have been a customer of Loon Reservations for many years and very satisfied with their services. Unit 49 had some issues this year. The stove did not work and the furniture seemed pretty used. The location of this unit is great but I think we will look for a different unit next year. Thank you for your frank comments. We will pass them on to the homeowner. We do have other options at Lincoln Station, if that is of interest. THe place was spotless. It was centrally located. The only negative was the lack of air conditioning although I was provided with fans. We would stay here again. The place was clean and well stocked. It is the unit closet to the road, so there is quite a bit of traffic in the afternoon, but it didn't bother us. The twin beds had bedspreads but no blankets, and the queen bed had a blanket but no bedspread. We did find 2 twin size blankets in the master closet, but it was chilly enough to wish all three beds had blankets and bedspreads. The kids loved the reclining chairs built into the couches. We also wish there had been instructions on how to work the tv and which remote went with it, but my oldest managed to get things working after an hours effort. Overall it was a nice place. We have rented this condo for two winter seasons. Everything was great! Two minutes from Loon, not fancy but everything works, clean, comfortable and well stocked, short walk to club house, ample parking, quiet. Very convenient to anything in town. Loon Reservation service is always very professional and accommodating. Great to deal with in every respect! Looking forward to renting again next winter. Thanks! We look forward to seeing you again too! Karen G from Worcester, MA does not recommend this vacation rental. I have stayed at Lincoln Station in the past and have always been very happy. This year, however, I was not as pleased with the condition of the property. It was dirty and I had to vacuum the townhouse when I arrived. There were piles of wood in garbage bags and an old screen house out on the back deck that I had to move. Also, the townhouses that I have rented in the past have abutted the river. This time, the townhouse was located at the beginning of the property and abutted the busy road which was noisy. I wish I had known this prior to renting. Overall, we had a good stay but I was disappointed in the accommodations. We're sorry that you did not enjoy this home as much as others from previous years. If you should find such a situation again, please give us a call as soon as you can, and we will be happy to send someone over to vacuum and clean off the deck. We do apologize that you found things not as clean as you should have. We do have a map on each home's webpage, to assist in seeing where, even within a resort, a home is located. But give us a call when you reserve and we'd be happy to help you decide on the best location for you. Very clean and comfortable. Well furnished. Plenty of room. Outstanding location less than two minutes to Loon. 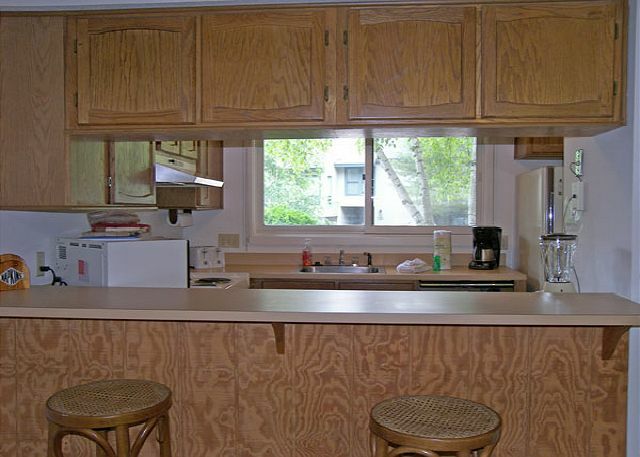 Quiet setting but very close to restaraunts, grocery store, and anything else you might want. Loon Reservation Service was great to deal with. We rented for the ski season and will rent again for next year.! a guest from Quebec, CA does not recommend this vacation rental. Many condos available in the area and probably some more recent. We had a fun time and a great stay. The staff was very attentive and responsive. The condo although dated was neat, clean and had plenty of room. Jeffrey D from Lynn, MA does not recommend this vacation rental. Great home to stay at for three days, but we were looking forward to a hot jacuzzi and pool at the end of our active days. Honestly, the jacuzzi was gross....hairs and whatever floating in it...wasn't clean at made us wonder about the pool when we saw the jacuzzi so dirty...we will not stay here again for this reason. Thank you for asking. There were three of us travelling to Lincoln for the NH Highland Games. We loved staying in a condo nearby. The condo was convenient and a perfect "home away from home". It made our stay easy and comfortable. The place and location was great. The rental fee was high, I thought. a guest from Dover, MA does not recommend this vacation rental. While we liked the location and the space was large - the couches were old and did not look very clean. They need to be replaced. The carpet could also use a cleaning. The bathroom in our bedroom had a very old floor. It was dirty ( just due to age - not due to lack of trying) and was peeling up. Generally the condo is in need of updates. Also, the clothes washer was so loud, though the units do look pretty new.With updates, the condo would be really great as its location and space are perfect.